There are healthy fats. Good ones. Ones that are crucial to health and vitality. Ones that enrich our bodies and make our systems run smoothly. One of the MOST important is essential Omega-3 fatty acid. Vegetarian sources like walnuts, kale and spinach provide some version (ALA) of essential fatty acids though the richest and best sources come from oily fish like WILD salmon and WILD halibut (DHA). These foods should most definitely be incorporated into your weekly routine. But can you get enough healthy fats that way? Not really. You need more. High-quality fish oil supplements provide concentrated, clean nutrition that supports healthy brain function, eye health, cardiovascular health and joint health, just to name a few. Without question, everyone should take high quality Omega-3 fish oil supplements. Why? Fish oils contain essential fatty acids, which are nutritional cornerstones of human health. We must have these healthy fats in our system (they are essential), but our bodies do not make them. We must therefore consume them through diet or supplementation. What are Omegas good for? Emotional, physical, oxidative stress causes inflammation in our bodies. Omega-3s quell the inflammation and promotes a healthy, happy and highly functioning system. So, you say, like what? Omega-3s for Kids! Brain function, mood, attention – Children have the most to gain from these essential fats for visual, brain and immune system development, and for normal emotional and cognitive function. Omega 3s also support focus and attention. Dr. Kenneth Bock is a big proponent of fish oil supplementation in “Healing the New Child Epidemics: Autism, ADHD, Asthma and Allergies.” Essential fatty acids have been shown to positively impact children in LOTS of ways. Along with a healthy diet that includes WILD fish and fresh green leafy vegetables, supplementing with a premium fish oil product is a great way to ensure your family is nourishing brain and body. Omega-3s for the Back and Joints – These “fat guys”can actually help to alleviate pain associated with physical stress to the back and joints. The nourishing fat promotes back and joint health and flexibility. Omega–3s for Hair, Skin & Nails – Our skin is the largest organ in the human body and is often the first visual indicator of an essential fatty acid deficiency. Omega-3s nourish & protect against age–related damage, hydrates skin by retaining natural moisture, and supports a clear and healthy complexion. Another way to GET YOUR GLOW ON. Despite the great health benefits of Omegas, most of us suffer from Omega–3 deficiency. With a diet rich in green leafy vegetables and wild oily fish like salmon, along with high quality supplements you can begin to nourish, heal and protect your system. Make these supplements a priority. Dr. Andrew Weil recommends eating oily fleshed, wild caught, cold water fish 2-3 times per week. He recommends taking a fish oil supplement that provides 700 to 1,000 mg of EPA and 200 to 500 mg of DHA daily in the smallest number of pills. 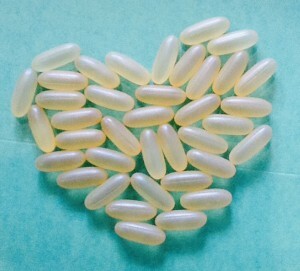 It is critical to get the highest quality, freshest fish oils—purity is key: free from toxins, heavy metals, PCBs. As with most things in life, you get what you pay for. The only brand The GEM girls take is Nordic Naturals, who has a 3rd party analyze that the products stick to strict standards. The Ultimate Omegas are the finest on the market and we offer these inside The GEM. Nordic Naturals brand is AWESOME both as a company and for their products. These folks know their stuff! This entry was posted in Food Secrets, Happiness, Health, Supplements and tagged ADHD, American Heart Association, Asthma and Allergies, autism, Dallas juice bar, Dr. Andrew Weil, Dr. Kenneth Bock, fish oils, Healing the New Child Epidemics, healthy diet, healthy hair, healthy skin, heart health, juice cleanses, Nordic Naturals, Omega-3, Omega-3 fatty acid, Omega-3s, The Gem, wellness on October 1, 2013 by diamondsonyourinside.